Before Pear Note 1.3.4, if you dragged slides or media to Pear Note, it would create a new Pear Note document and import that file into it. Unfortunately, sometimes you might have wanted to add those to a currently open document instead of creating a new document. 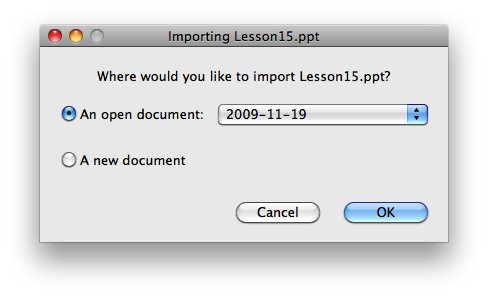 With Pear Note 1.3.4, if you have an open document, Pear Note will ask if you’d like to import the file into an open document or a new document. Pear Note can import slides itself, but it is admittedly not perfect when it comes to importing PowerPoint. Consequently, many of you open your slides in PowerPoint, print them to PDF, then import the PDF into Pear Note to ensure the slides look exactly as they do in PowerPoint. 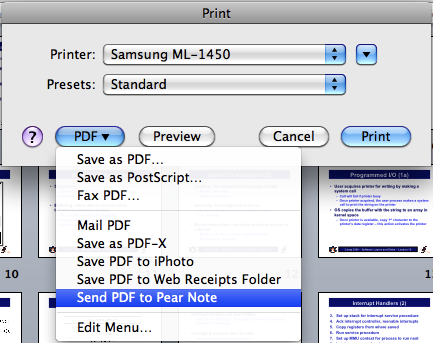 With Pear Note 1.3.4, this just got easier as Pear Note now provides a PDF Service. This means that there will be a “Send PDF to Pear Note” item in the PDF button in all applications, and if you select it the PDF PowerPoint produces will be sent straight to Pear Note. Prior to Pear Note 1.3.4, you could go to a slide during playback and everything would jump to the first time that slide was shown. This worked pretty well, but many of you scan through your slides early, which meant that the first time you saw the slide was not when the speaker was actually talking about that slide. With Pear Note 1.3.4, Pear Note now jumps to the time the slide was shown for the longest duration, which means you won’t fool it into thinking you’re on a specific slide just by scanning around.